Look closely at this rock, see the ripples and waves which make it up. Honestly, it looks more like water than a rock at times. You cannot understand life and its mysteries as long as you try to grasp it. Indeed, you cannot grasp it just as you cannot walk off with a river in a bucket. If you try to capture running water in a bucket, it is clear that you do not understand it and that you will always be disappointed, for in the bucket the water does not run. To “have” running water you must let go of it and let it run. ~Alan Watts from “The Wisdom of Insecurity”. The New England Journal of Medicine reports this week that GSK has just been fined $3 billion, and that since 2009, drug companies have been fined $11 billion! Wow! Colossal sums, huh? However, it turns out these figures represent only about 10% of annual profits and should probably be considered as just the “cost of doing business” ie these fines won’t change behaviour. Should we be worried about these crimes and misdemeanors? You bet. However, as Ben Goldacre points out in a Guardian published extract from his upcoming book, “Bad Pharma”, this is just the tip of the iceberg. Of more concern is routine distortion of the evidence base which is manipulated in a variety of ways by those who pay the piper – the drug companies. Read the Guardian article, then answer the following two questions…..
How confident are you that the drug companies act in your best interests? How confident are you that “evidence based medicine” is based on objective, relevant scientific evidence? I mean, where you see a path like this? And where you find a “moss garden”? Because that’s what this is – a path through a moss garden in Nara. Doesn’t it inspire you to think about the paths we make and how we all make such different ones? Wow! Look at the shape of this tree! 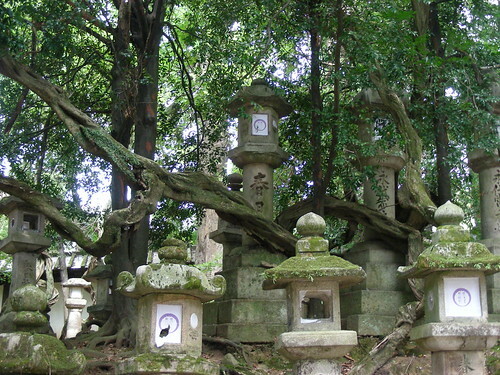 Look how it has wound its away amongst the stone lanterns. Isn’t that amazing? Did someone train it this way? There’s no sign of that, but maybe all the training was done years ago and the ropes, ties and poles have long since gone…..but maybe it just made it’s own way amongst the lanterns. Either way its beautiful to look at, and quite breathtaking to see just how utterly entangled it and the lanterns have become. I grew up thinking of nature as a collection of species, each one self-reliant and independent, the way a good farmer was supposed to be. It’s an illusion we cling to. But nature is nothing like that, of course. It knits and unravels and reknits. At times, it looks to me as though organisms conspire, as when a weaker vine climbs a stronger one to get to the clapboards sooner. The one thing no species can ever be is self-reliant. Because entangled is the condition of life itself. 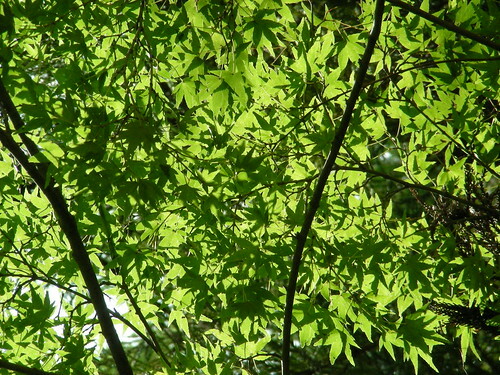 I love to look up and see how sunlight shines through leaves, and creates an intricate pattern of colours and shadows.